Happy New Year! 2015: it has a good ring to it, hasn't it? Solid. And yet it feels like it's pushing us forward. It feels like its pushing me right into something completely new. Next Friday I'll be taking part in a webinar for the first time ever. Definitely something completely new! I'm going to be talking to Debbie Hodge for an hour on Friday 9th January at 10am EST (that's 3pm GMT), as part of my contribution to her new class Single & Pretty. 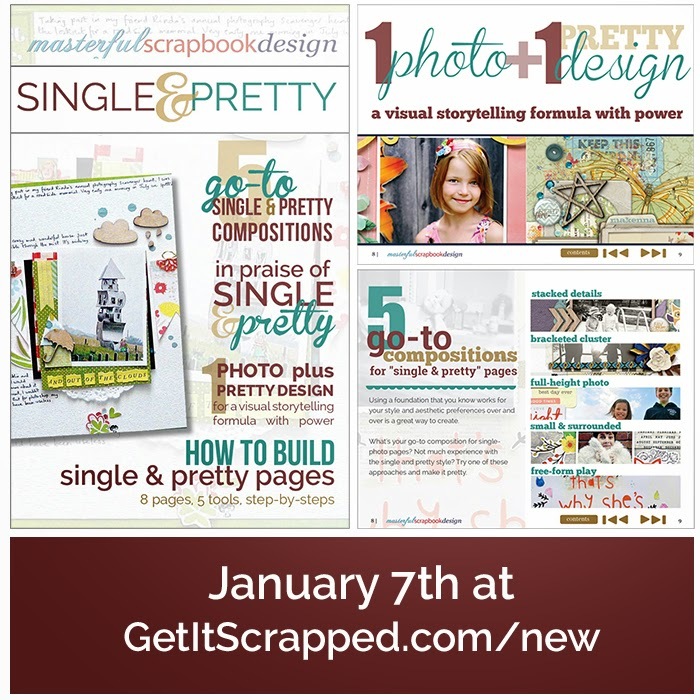 Single & Pretty is all about making embellished, one photo pages which tell a great story and it's available to everyone with a Get It Scrapped membership. 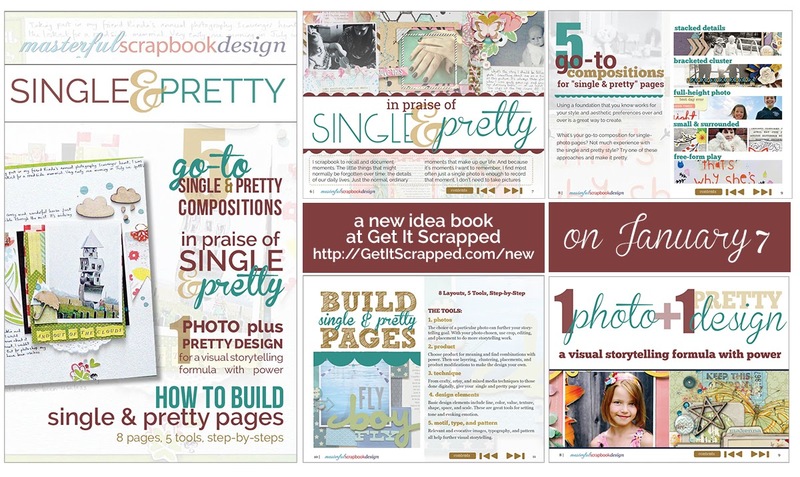 I'm very excited to be joining the other contributors - Amy Kingsford, Ashley Calder, Kayleigh Wiles and Lisa Dickinson - who have made gorgeous single and pretty pages for the ebook. We'll all be talking to Debbie at some point in the next three months. I'm up first on Friday, with an office hours session in which Debbie and I will talk about the pages which members have uploaded to the critique gallery; and I'll be back at the end of February to talk in more depth about the pages I have made. So if you have a Get It Scrapped membership we'll be able to chat! And if you've been thinking about a Get It Scrapped membership, now would be a great time: I have a special offer for you. If you follow the link below, you'll be able to take up a 3 month membership for $30. The ebook is released on 7th January and I'm up on the 9th. That's my first new-thing-to-try for 2015. How about you? Good luck with class - I've no doubt you've whipped up some extra pretty single pages! Congratulations and good luck! What a fabulous start to the new year. I wish I could be part of it :-) but I'm sure it will be a raging success! Wow, what a stellar start to 2015, Sian! I am sure you will have lots to contribute - it will chime so well with your style, the series. Wishing you every success :). That sounds really exciting....what a great start to the year. How very exciting, Sian xxxx You'll rock it! What a great start for the new year - trying something new! I tried that new water aerobics class already & am starting a worship journal, which is new to me also. How fun and exciting for you Sian! I'm sure you'll be fantastic! Happy New Year to you too and food luck for Friday! So cool, I know it will be a great chat session. It was fun to hear Abi's real voice when she did one. She sounded very different than I imagined. So excited for you Sian!!! I hope you have lots of fun, just relax and be yourself, I know you will be great.